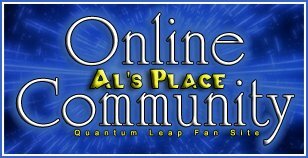 Hey all, today I am happy to confirm to al Quantum leap fans that I am making a series! Of course it won't have the usual Sam Beckett and Al Callavichi, instead there are two young teen age boys both called Sam and Al- there willin the future be a reason why the names are the Sam but for now lets concentrate on the start of it all. Series one has been planned and the first 3 episodes out of 9 have been written. Episode one is due in 2008 with the rest of the series following in 2009. The creators are Whoniversal Productions and Rocket laser Productions. We are two ameture film makers who are intent on making this series the most best of our projects. Locations will include a church, a club, a great big house and even a hospital. the few that arn't filled in will be announced when episode 2 is released. This series starts off very different from the orgianal but ends up in episode two being very simular. I hope you enjoy the upcoming series. To see the series watch it on the you tube chanal AllanRafferty. The video's on there look cheap but i assure you the series will be worth the wait. Is Li'l Al going to be in crazy outfits? Sounds wonderful. I'm not really to familiar with YouTube... Do you have a link or such that I could get to that from this thread? A few weeks ago, I actually checked on your forum website, because I remembered it and wanted to see if you still were going through with your series. It's great to see that you are, and I hope that production goes well for the first episode. Would you make more than one series? Anyways, great video! I'm looking forward to seeing the completed episodes. That exchange seemed like something right out of Quantum Leap. It was so much fun to watch! Awesome, thanks! You know, this would look ever better with tighter shots.